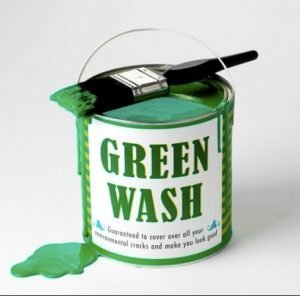 Now that we know what greenwashing is and the different ways manufacturers and advertising agencies manipulate consumers, the final question is this: How can we avoid being greenwashed? No one wants to fall prey to false advertising. Not only can these invalid claims be harmful to environmental or human health, but it can also be a huge drain on your wallet. It pays to be a savvy consumer – of both products and scientific claims! Because of the sheer number of products that are guilty of greenwashing, it can be hard to navigate what’s true or false. Not all labeling is greenwash, but it can be difficult as a consumer to navigate which claims are valid and which ones are deceptive or flat out lies. Here are some ways to critically evaluate the claims. Do not be fooled by the color green! Pretty pictures of the earth and flowers don’t mean this product is safe or healthy. Advertisers prey on consumer’s automatic assumption that green equals healthy. Take your time to evaluate the product and the label. Maybe even pick up a similar product without a “green” label and see how similar or different the ingredients are. Consumer Report’s Eco-Labels Center (http://www.greenerchoices.org/eco-labels/lets) creates a “report card” for products and labels by grading how meaningful their claims are. They help you evaluate labels and browse through specific labels by company or category. Bring your smartphone to the store with you for easy reference. Check out http://www.ecolabelindex.com/ecolabels/ . They evaluate the different labels and certifications used and the credentials each product must meet to receive the right use their seal of approval. Look for “meaningful claims.” If something says it’s “all-natural”, “organic”, or “eco-friendly”, turn the product over and look at the label. If this claim is true, the label should explain how it meets these assertions. Avoid products that say CFC-free or Phosphate free, since these agents have been banned for decades. Question claims like “50% more recycled material” or other percentage claims. 50% more than what? If they don’t clarify, it doesn’t mean much! Until there is one unifying body that certifies the scientific validity of the health and environmentally friendly claims, consumers have to remain vigilant against greenwashing. Keep the health of your family, the environment, and your wallet in mind while purchasing health and cleaning products.